SIGMA asphalt plant having 260 t/h production capacity, has been commissioned and started production with a ceremony organised by our customer. 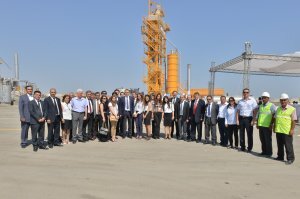 Also, local government authorities, Azerbaijan Employers Confederation officials and press members attended the opening ceremony together with the top executives of the company. The ceremony drew significant attention of the local media. Sabuncu District Governor Mr. Adil Veliyev and Azerbaijan Employers Confederation President Mr. Mehmet Ozturk both made speeches at the ceremony, emphasising the importance of this asphalt plant investment for the region. Also, general manager of the company Mr. Goksel Aybek made a speech explaining that the SIGMA asphalt plant will play an important role for building and renewing the region’s road infrastructure. The plant is equipped with bitumen and PMB tanks with 50 tons capacity each, and a 85 tons capacity double hot-mix silo with two separate compartments for storing different types of asphalt. The plant is completely automated and computer controlled with the in-house made SIGMA automation system.